Fortune has done its usual analyst poll ahead of Apple announcing its Q1 earnings tomorrow, and Wall Street is expecting the company to significantly out-perform its earnings guidance of $63.5 to $66.5B. The consensus among the analysts Fortune polled — 20 professionals and 15 amateurs — is that Apple’s total sales for fiscal Q1 2015 will come in at about $68.3 billion, up 21% year over year. Apple also said then that it expected its gross margin to come in between 37.5% and 38.5%, but it has been suggested that the popularity of the iPhone 6 Plus, along with customers upgrading to the middle storage tier after Apple boosted it to 64GB, may have boosted margins. Fortune suggests that anticipated high sales numbers of the iPhone 6 Plus will have played a major role in analyst expectations, with the all-time high in Mac sales forecast predicted by IDC also contributing to high expectations despite declining iPad sales. The consensus expectation is for Apple to announce 66.5M iPhone sales. 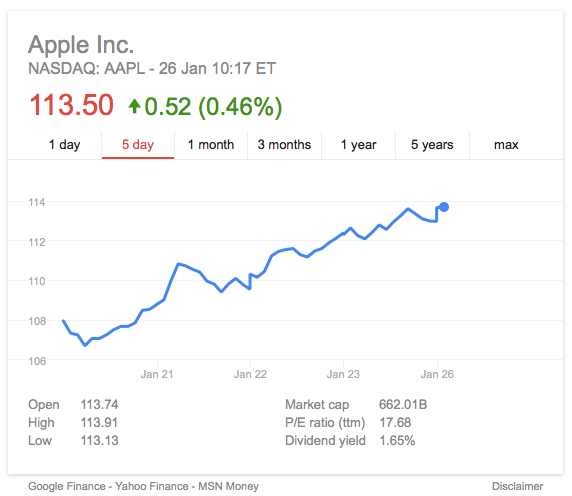 Apple stock has climbed in recent days, currently sitting within 6% of its all-time high. Subsequent share movements are likely to reflect any difference between expectation and reality, as well as the company’s guidance for the following quarter. As always, we’ll be bringing you all the numbers tomorrow.